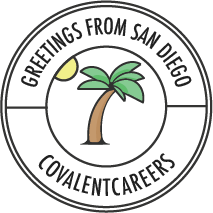 CovalentCareers is a rapidly growing startup, steps from the beach, in beautiful San Diego, CA. Our values as a team lie on a foundation of learning, growing, and crushing goals every day. Our team's growth and happiness are our top priority and will forever receive our fullest attention. When everyone is stoked about what they do and where they work, we are able to build a team of A-players that are ready for anything. That's where you come in! At our core, we are a media & technology company, and we eat, sleep, and breathe product, and that product wouldn't be the game changer that it is today without the right people to spread the good word. Our recruiting team is comprised of charismatic visionaries who understand the importance of perseverance, who bound over bars that others think are too high, and who are driven by a need to grow. This position will provide you the opportunity to learn recruiting and grow within our organization. Join one of California’s fastest growing technology companies in the healthcare staffing and career development space, located right in the heart of San Diego. Having an office a few blocks away from the beach comes with its perks: walk to local coffee shops and breweries, collaborate with teammates over some of the best fish tacos in San Diego, or take a stroll down the energetic Garnet Ave. You can bike down to our office in Pacific Beach to enjoy the ocean breeze through our open-air, wood-structured office space. What does it mean to be a successful Associate Recruiter at CovalentCareers? We are looking for a rockstar— someone who can find a win anywhere, who can define themselves as a go-getter, and who can see a goal ahead and blow it out of the water. We want someone on our team who walks in every morning with a passion for catapulting their career and the company forward and the willingness to learn and grow every day. What are the top 4 must-have qualities for our Associate Recruiter? Passionate People Person. You are the type of person who thrives on human interaction. Whether it’s with candidates over phone or in-person with your team at the office, you operate best in environments where personal connections are your everyday norm. Efficient Communicator. Let’s face it, recruiting is all about incredible communication, with candidates and clients alike, and doing so as quickly as possible! If you love conveying information over phone, text, email, chat, and by using the latest software, this position is for you! Flexible Organizer. We work with many people across a variety of platforms, so organizational skills are a must! Our team has been successful because we are agile and able to drop one task at a moment’s notice or pivot entire strategies so that we can pursue the most important opportunities. Lifelong Learner. We are a fast growing company, and with growth comes new challenges. You will be expected to keep up with a dynamic environment and learn on the go. We are constantly adopting new technologies and processes to help us perform better. You must be the type of person who thrives in environments where learning is an everyday thing. Top candidates will also have . . .
Base salary will vary depending on experience, and you stand to make a base salary that competes with some of the biggest players in San Diego. But when it comes to our commission structure, the sky's the limit. The greatest benefit we offer is the freedom to define your role and ability to make key decisions that have a direct impact on the success of the company.